Gotta love these scheduled updates. Hello from the other side of the country to where I usually am! It's my other half's birthday today and I'm writing this several days ago in the midst of packing to visit his parents. 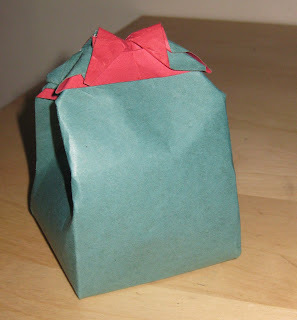 We've carried a bagful of presents with us and here are the ones which I have made (I went a bit mad, as you can see!). We're going to see Tim Minchin the day after A's birthday - I've had the tickets for ages and I'm sure he's mostly forgotten about it. 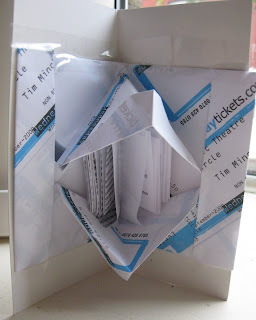 I didn't want to take the tickets with us in case they got mislaid, so I photocopied them several times onto one piece of paper, then folded it into a mouth shape. Inside the mouth is one of Tim's poems (an epic 9min beat poem, so it printed out to about four lengths of A4! Listen here), to form the tongue. So I hope this will give A a good laugh and have him looking foreward to the show. I made this amazing Chocolate Macadamia Fudge Cake (which has probably all vanished by the time you read this) - I just wanted to use up some egg whites but I think this will become a favourite. It's incredibly rich - half a kilo of Green & Black's 70%, for starters. Also very gooey! Follow the link for a pic - mine is already packed away at the time of writing. 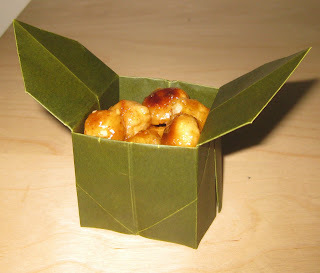 I had some leftovers from the cake and have recently mastered the not-very-difficult sugaring of nuts, so I syruped up the last of the macadamias and made a little sanbo box for them. This box is made from vellum, which I hope will keep the sugar and any grease in the box. Nice and easy to fold but a bit deceptive - the bottom of the box is much higher up than you think it will be so it's not very deep. Nice for a table display, but not as practical for a gift - I'd go for my usual masu box next time, I think, although again these don't come out very deep. And finally - a major left-over from this cake is a bottle of rum. 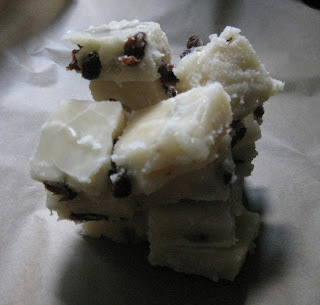 A's favourite fudge is rum & raisin, so I had a go at making some. It's not great in texture, though it tastes pretty good! I had a lot of fun making it and learned a lot about boiling sugar very quickly, eep. Many thanks to a Kiwi friend for the recipe, which does not include condensed milk (hurray for evil-free sweets!). Of course, you need a fancy bag for such homemade goodness and here it is. This is made of duel-colour card. I think in retrospect it was a bit stiff and I didn't crease it very well, but again hopefully the thickness of it will stop any grease coming through for a few days. And skilled as it undoubtedly is, I am a lazy person and would probably not bother with the top folds next time - a couple of punched holes and a ribbon would be just as effective! All origami is from A Handbook of Origami , which I would certainly recommend if you fancy having a go!